Below are answers to the most commonly asked questions. If you don't find what you're looking for, please contact us. 1. What wastewater infrastructure does the Sanitation Districts manage? 2. What is the Joint Outfall System? 3. What is the Clearwater Project? 4. Why a new tunnel? 5. What alternatives were evaluated? 6. What is the construction schedule? 7. How will tunnel construction affect my home, my community, and me? 8. What streets will the tunnel go under? 9. Will the new tunnel result in more air pollution in the Harbor area? 10. Will the new tunnel result in significantly more local traffic? 11. What is the risk of settlement or damage to buildings during tunneling? 12. What types of geotechnical monitoring instruments will be used along the tunnel alignment? 13. What assurances/guarantees can the Sanitation Districts provide regarding the potential for property damage due to tunneling activities? 14. In the Palos Verdes Peninsula, we have active coastal bluff landslides and our homes and roads are continuously at risk. How can you guarantee that this construction will not trigger another event or make an existing situation worse? 15. How can the Sanitation Districts assure that vibration/settlement from tunneling will not impact old utilities in the area that may be transporting hazardous materials along North Gaffey? Some of the utilities/pipelines were installed decades ago and an exact location may not be known. 16. Will you shore up the slope at Royal Palms Beach? 17. Will noise be reflected off the construction sound wall towards the neighborhoods above the bluff? 18. What will be the trucking activity out of Royal Palms? What roads will they follow with heavy trucks? 19. Will streets be affected by construction? 20. What is the budget for the project? 21. How are you funding this project? 22. Would recycling 100% of the treated wastewater at JWPCP be a way to avoid building a new tunnel? 23. Will water conservation efforts reduce the need for additional effluent management capacity? Created in 1923 under state law, the Sanitation Districts of Los Angeles County ("Sanitation Districts") are a regional agency that manages the wastewater (sewage) and solid waste (refuse) needs of over 5.6 million people in 78 cities and unincorporated county areas. The Sanitation Districts consist of 24 independent special districts that share one staff under a joint administration agreement. Each district has a Board of Directors, which is comprised of the mayor of the member cities and the Chair of the County Board of Supervisors for unincorporated territory. The Sanitation Districts operate and maintain over 1,400 miles of sewers and 47 pumping plants that convey more than half the wastewater in Los Angeles County to 11 wastewater treatment plants. Approximately 400 million gallons of wastewater (sewage) are treated every day at these facilities. Ten of these facilities are located inland to support water recycling and are called water reclamation plants (WRPs). The WRPs produce highly treated water that is used in a variety of ways including landscape irrigation and groundwater replenishment. The Joint Water Pollution Control Plant (JWPCP), located in Carson, is the Sanitation Districts' largest facility with a treatment capacity of 400 million gallons per day (mgd). The JWPCP currently treats about 260 mgd and discharges treated water to the ocean through two tunnels and an outfall system. The Joint Outfall System (JOS) is a large sewerage system that collects wastewater from 73 cities and unincorporated county areas in the Los Angeles basin and directs flow to one of seven wastewater treatment facilities. The JOS, which serves over 5 million people, is designed so that the inland WRPs collect lower salinity (less salty) sewage for treatment and reuse nearby. The solids removed from the wastewater during treatment are returned to the sewer for centralized treatment at the JWPCP. This design reduces costs to ratepayers. Upstream flows that cannot be accepted at the WRPs (because the WRP is running at capacity or the sewage is from industry and has high salinity) are directed to the JWPCP. The treated water from the JWPCP is conveyed six miles to Royal Palms Beach via two tunnels and is then discharged approximately 1.5 miles off the coast through ocean outfalls (perforated pipes on the seafloor). Because all solids and the majority of the JOS flow must pass through the JWPCP, the JWPCP and its effluent management system (tunnels and outfalls) are critical to the 5 million people served by the JOS. In 2012, the Sanitation Districts' Board of Directors approved the Clearwater Project to protect local waterways by addressing aging infrastructure. 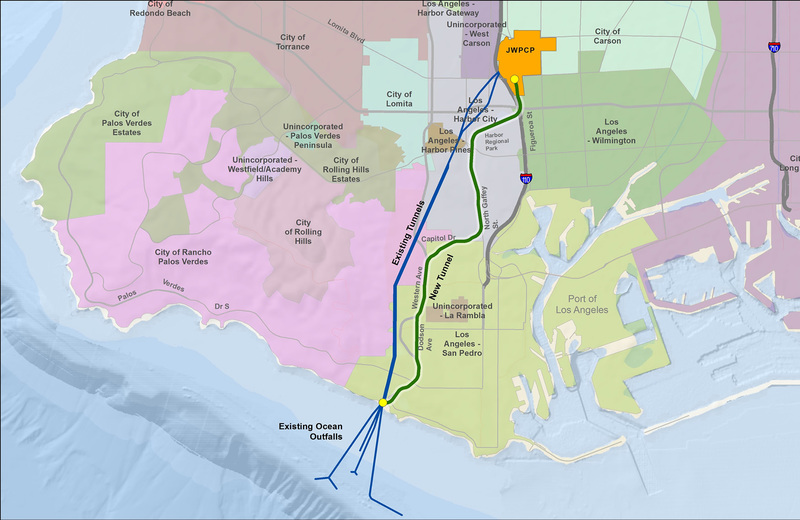 Under the project, a new tunnel will be built to convey treated water from the JWPCP in Carson to existing ocean outfalls located at Royal Palms Beach in the Palos Verdes Peninsula. This project was the result of a multi-year planning and environmental review effort that began in 2006 to ensure JOS reliability and sufficient capacity through the year 2050. During rainstorms, water enters the sewer system, causing higher than normal flows. The capacity of the existing tunnels was almost exceeded twice during major rainstorms, once as recently as January 2017. The two existing tunnels, which were built in 1937 and 1958, cannot be taken out of service for inspection and repair because they must continuously carry flow. The existing tunnels are not built to current seismic standards, yet they cross two earthquake faults. The existing tunnels are an important part of the JOS and their reliability is critical to protecting public health and the environment. Structural failure or inadequate tunnel capacity would require partially treated or untreated wastewater to be discharged to surrounding waterways, which could lead to environmental degradation for an extended period of time. The new Clearwater tunnel will protect surrounding waterways by addressing the identified concerns. In 2006, the Sanitation Districts began a multi-year planning effort to identify improvements needed to ensure JOS reliability and sufficient capacity through the year 2050. A primary concern was reliable and adequate capacity from the existing tunnels as noted in response 4. Alternatives to address this concern were evaluated including one involving large-scale water recycling at the JWPCP that significantly reduces tunnel flows and enables the two existing tunnels to be improved one-at-a-time. This particular alternative was found to be infeasible. The alternative involving a new tunnel was the highest-rated, feasible alternative. Twenty-two different tunnel alignments were evaluated and over 500 public outreach meetings were held to solicit input. Based on this comprehensive effort, the tunnel alignment with the least environmental impacts and lowest cost was selected by the Sanitation Districts Board of Directors in 2012. After the Clearwater Project was approved, a large recycled water project at the JWPCP known as the Regional Recycled Water Project was proposed. In 2016, the Sanitation Districts conducted a technical review of the Clearwater Project to determine if a new tunnel would still be needed if the Regional Recycled Water Project is implemented. The technical review determined that a new tunnel would still be necessary to reliably protect public safety and the environment. In 2017, the Los Angeles County Department of Public Works conducted an independent review of the Sanitation Districts' 2016 technical review and concurred with the determination that the new tunnel is still needed. The tunnel will be constructed utilizing a state-of-the-art tunnel boring machine (TBM). This multimillion dollar TBM will be specifically built for this project. The new tunnel will mostly be located under public right-of-way (i.e., streets) and will not pass under any homes. The tunnel will be 30 to 450 feet deep and will produce no noticeable vibration or noise on the surface. As a safeguard, tunnel construction will be closely monitored using an extensive geotechnical monitoring system consisting of over 1,000 locations installed along the tunnel alignment. In the unlikely event that movement at the surface is detected, tunneling will be slowed or stopped and the TBM settings will be adjusted. The project is designed to minimize community impacts by limiting construction to two sites for tunnel access shafts. At the JWPCP access shaft, the TBM and construction materials (e.g., liner segments) will be lowered into the ground and soil from tunneling will be removed. The access shaft site will be screened with barriers to minimize visibility of construction activities and offsite noise. A smaller exit shaft is needed at Royal Palms Beach to remove the TBM and connect the new tunnel to the existing ocean outfalls. This site will also be provided with a visual/noise barrier. Work will be confined to as small of an area as possible to minimize the effect on beachgoers and parking. The beach will be accessible at all times. The Environmental Impact Report/Environmental Impact Statement (EIR/EIS) assessed potential impacts of the project and identified mitigation measures to avoid significant impacts. The Sanitation Districts will implement these measures including requiring trucks to be powered by modern, clean engines. The alignment for the new tunnel follows public right-of-way (i.e., streets) as much as possible to avoid going underneath homes and businesses. As shown in the figure below, the tunnel will start under the west side of the JWPCP, then under Figueroa Street, Harbor Regional Park, North Gaffey Street, Capitol Drive, Western Avenue (through South Dodson Avenue), and end at Royal Palms Beach. The tunnel must pass under commercial property to make the turns from Gaffey to Capitol and from Capitol to Western. Because the tunnel will be constructed approximately 30 to 450 feet below ground, street level impacts are anticipated to be imperceptible. As a safeguard, an extensive geotechnical monitoring system will be installed along the alignment to closely monitor for a variety of parameters including vibration and settlement. Once constructed, the project will result in no air emissions. While the trucks and other equipment will result in increased air emissions during construction, mitigation measures will be implemented to minimize these impacts. Mitigation measures include the use of haul trucks powered by modern, clean engines and routing construction traffic away from congested streets and sensitive receptors, where feasible. Once constructed, the project will have no impact on traffic. During construction, the project will require traffic trips for workers, supplies and the soil from tunneling. At the JWPCP shaft site, trucks will be routed north on Figueroa Street, west onto Sepulveda Boulevard, and then onto the Harbor Freeway-a route that does not pass any residences. The impact of this traffic was analyzed in the EIR/EIS and found to be less than significant. Nonetheless, we will work with the cities of Carson and Los Angeles on traffic plans to minimize the impact to the community. Today's modern tunnel boring machines (TBMs) are sophisticated and provide a very controlled tunneling process. TBMs are used worldwide to tunnel under urban areas. These machines work by placing the outer wall of the tunnel (ring) in 5-foot segments before digging the next five feet. This construct-as-you-go approach provides immediate support to the surrounding soil. Throughout the tunneling process, settlement will be monitored and changes in the tunneling operation will be made if settlement approaches the strict operating limits. For most of the Palos Verdes Peninsula, tunneling will occur deep below the surface. Ground Surface Monitoring Points (GMPs) - GMPs are reference points installed at the ground surface to directly monitor for any ground deformation or settlement. These monitoring points will be installed every 300 to 1000 feet along the alignment. Utility Monitoring Points (UMPs) - UMPs consists of fixed vertical rods that touch an existing subsurface utility to detect any movement. UMPs will be spaced every 25 to 100 feet along the stretch of the utility that overlies the tunnel alignment. Multiple Position Extensometer (MPX) - MPXs monitor for settlement at multiple depths below the ground surface to provide an early-warning system for potential settlement near the surface that could impact surface structures and buried utilities. MPX detectors will be installed from 5 feet above the top of tunnel to the ground surface in equal spacing. The MPX detectors will be installed along the tunnel alignment approximately every 500 feet. Displacement Monitoring Points (DMPs) - DMPs consist of monuments or other fixed points on a structure that will be used to determine whether ground movement, if any, is from the project or another source. Vibrating Wire Piezometers (VMPs) - VMPs track any changes to groundwater levels during excavation. This information will assist the TBM operator in making adjustments. Inclinometers - These instruments measure lateral ground movement and are installed near the surface. Vibration Monitoring - Instruments will be placed in locations near homes and businesses to detect any ground-borne vibration and noise from tunneling activity. In addition, pre- and post-construction inspections will be done to compare conditions before, during, and after tunneling. This data will help in determining the changes, if any, from the project. As mentioned in response 7, we anticipate surface impacts from tunneling to be imperceptible. With the geotechnical monitoring system mentioned in response 12, we will be investing $7 million to ensure safe tunneling. Ultimately, our agency's mandate is to safely and responsibly serve the public, which includes accountability for any damage caused by our construction projects. We have multiple ways for the public to communicate any concerns including a project email address (ClearwaterProject@lacsd.org), hotline (877-300-WATER), and website (www.clearwater.lacsd.org). Any concerns will be addressed in an expedited manner. Unfavorable bedding - This condition occurs when the thin layers that separate the rock layers, called bedding planes, are angled or tilted downward towards the ocean. Weak bedding plane - A weak bedding plane occurs when the bedding plane is made of weak material, such as bentonite clay. Wetted bedding plane - This condition occurs when water has passed through the rock formation and wetted the bedding planes. In the case of bentonite clay, water turns the clay into a slippery surface. Landslides can also occur without a wetted bedding plane if the base of a bluff is undermined, such as erosion caused by ocean waves. All of these factors were identified as causes of the nearby White Point Landslide by the City of Los Angeles' geotechnical consultant. At Royal Palms Beach, these factors do not exist. The bedding planes are angled upward (more favorably) and are highly folded, making the geology stable. Additionally, the bottom of the bluff is protected from erosion caused by ocean waves. Moreover, the existing two tunnels were constructed in the late 1930s and 1950s by blasting through bedrock and no landslides occurred at Royal Palms Beach. Today, tunnels are created using tunnel boring machines (TBMs) that generate much less vibration, with vibration levels well below what could cause a landslide. As a safeguard, tunnel construction will be closely monitored using an extensive geotechnical monitoring system consisting of over 1,000 monitoring locations installed along the tunnel alignment. In the unlikely event that movement at the surface is detected, tunneling will be slowed or stopped and the TBM settings will be adjusted. The tunnel will be about 50 feet deep in this area, which is much deeper than utility lines are located. Even so, the Sanitation Districts have contacted all the local governments and utility companies along the tunnel alignment regarding utility lines. Engineering drawings for the tunnel design were shared with these entities and their feedback was incorporated. As noted above in response 7, all utility lines crossing the tunnel alignment will be monitored for settlement. If settlement approaches the strict operating limits set to ensure that no damage will occur, changes to the tunneling operation will be made. Based on our geotechnical engineering investigation and the tunnel design, shoring of the bluffs is not necessary. The Sanitation Districts assessed noise and other impacts associated with the project in the EIR/EIS and adopted mitigation measures to prevent significant impacts from occurring. The Sanitation Districts will construct a wall that accounts for potential sound reflection to ensure that the neighborhoods above the bluff do not experience excessive noise during construction. The Sanitation Districts will develop a specific traffic plan that meets the requirements of local jurisdictions. During construction at Royal Palms Beach, trucks and construction worker vehicles would utilize the only access, the two-lane Kay Fiorentino from West Paseo Del Mar. From there, the truck route studied in the EIR/EIS was along Western to 9th Street and Gaffey. As discussed in the EIR/EIS, the surrounding roadways can safely accommodate the additional daily truck and worker commute trips with little to no traffic delay. At Royal Palms Beach, there will be an average of 10 truck trips per day, which will result in a maximum of 1 to 4 truck trips per hour during the day. The tunnel will be constructed completely underground, except for the shafts at both ends. The project will involve very limited work in the streets to install the geotechnical monitoring system and remove this system at the end of the project. This work will occur during off-hours to minimize impacts. No road closures are needed. Approximately $700 million, which includes design and construction management costs. The Clearwater Project will be funded through a combination of existing capital reserves and long-term financing. The long-term financing will ultimately be paid back through user charges, either service charge (residential/commercial parcels) or industrial wastewater surcharge (industrial users). Using long-term financing allows the cost of the project to be spread over a greater number of years, lessening the impact on rates in any given year. The current system-wide average service charge rate is $163 per year per single-family home, which is among the lowest in the country. Because existing Sanitation Districts' debt will be fully paid off in a few years, new debt related to the project will have a small impact on rates, with a one-time increase of $5 to $7 per year. Over the last 50 years, the Sanitation Districts have been the nation's largest producer of recycled water. In 2016, we recycled over 32 billion gallons of recycled water, which is enough water to supply the cities of Long Beach and Cerritos for an entire year. We continue to look for new opportunities to partner with water purveyors on recycling projects. The Sanitation Districts are supporting the Water Replenishment District of Southern California on a large water recycling project known as the Groundwater Reliability Improvement Project (GRIP). This project is currently under construction. The Sanitation Districts are also working with the Metropolitan Water District of Southern California (MWD) on the planning of a large potential water recycling project known as the Regional Recycled Water Project. As envisioned, the Regional Recycled Water Project includes a large water purification facility at the JWPCP that would purify treated water from the JWPCP and send that water throughout the region to replenish groundwater basins. While this project would help meet the county's water needs, a reliable tunnel and outfall system is needed for times when the water purification facility is out of service for maintenance or when demand for recycled water is low (e.g., after weeks of rainy weather). During large storms, flows into treatment plants increase and the potential water purification facility would handle less than half the flow treated at the JWPCP. The remainder would need to be discharged to the ocean. In summary, the new tunnel is needed to provide a safe, reliable wastewater management system regardless of the implementation of the Regional Recycled Water Project and additional water conservation. Over the past decade, water conservation efforts have delayed the need for additional facilities, and to some extent, it is anticipated that this trend will continue into the future. The Sanitation Districts recognize the environmental and economic benefits of water conservation and support the efforts of water supply agencies to increase conservation. The Sanitation Districts have assessed the overall impact of water conservation on flow projections. While conservation has reduced wastewater flows and additional conservation may further reduce wastewater flows, large peak flows during wet weather are still a concern as are the age and seismic vulnerability of the existing tunnels. Thus, a new tunnel is still needed even with ongoing conservation efforts.